Our membership fee is £5, paid once per year and then only 50p every time you come after that. The Way Wolverhampton Youth Zone is for all backgrounds, for all abilities, for all of the community open 364 days a year. The Way is a state of the art youth hub in the heart of the city. It’s a place where you can make new friends, take part in activities, chill out, play sports or try something new. 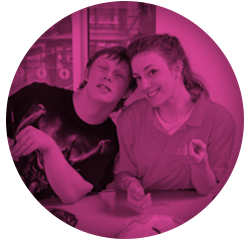 We offer all young people, regardless of ability the opportunity to access a range of activities like trampolining, karaoke, arts and crafts, cooking, gaming and much more. The Way is inclusive and we’d encourage people of all abilities to visit. Though we don’t offer one-to-one support, If you need the support of a carer they can come in with you too (they’ll need to provide reception with an up-to-date DBS check). You must stick to your age group though, Junior Club is for 8-12 years old and Senior Club is for 13-19years old or upto 25 with a disability. We have a Family and Disability session on Sunday 12pm-3pm with a team of dedicated staff. Young people can attend The Way with their families and there are loads of activities going on.